After 5 years, Blaqk Audio finally managed to release their sophomore album, Bright Black Heaven. 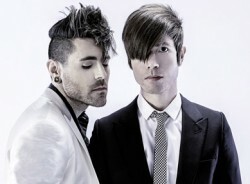 The electro-project features AFI's, Davey Havok and Jade Puget. Given Scene Point Blank's history of being born out of AFI's message board, it was a nice treat to sit down and talk with the guys on the first night of their tour up and down the West Coast in San Diego, where we discussed writing for Blaqk Audio, The Beatles, Jurassic Park, and so much more. Scene Point Blank: So, first night of the tour, are you guys nervous? Sounds like [Jade's] nervous. Jade Puget: Nah. I'm getting sick, but I'm not nervous. Scene Point Blank: Oh, alright. Yeah, something's been going around. Now, are you guys hoping to see more dancing or singing tonight? Jade Puget: We hope that it would be both. Davey Havok: Yeah. That would be nice. I can dance and sing at the same time.However people are enjoying it is fine as long as they're enjoying it. Scene Point Blank: I feel like since [Jade] writes the music, [he's] more excited to see how the fans react to the beats and all that. Jade Puget: Yeah, but he has to be closer. Like, I'm back there doing my stuff, whereas he's actually interacting right there. So it's equally important for both of us. Scene Point Blank: Since the new album's not quite out yet, are you guys kind of nervous that when you play a new song that nobody knows yet, they're just gonna focus on taking pictures or videos rather than actually dancing? Jade Puget: Well, people might be doing that anyway. [Laughs] That's just the way people are at shows now. Jade Puget: I think a lot of the songs we play have leaked--like live versions or whatever--to some degree. Scene Point Blank: Does it frustrate you when fansites or youtube users post videos-- like when you were in Australia and played new songs there--the fans filmed the new songs, and put it up. They're like, "oh, look a new Blaqk Audio song,"--does it frustrate you when the album actually comes out and you're worried the fans will be like, "eh, I've kind of heard this song already." Jade Puget: In a way it is. Scene Point Blank: You don't mind the exposure? Jade Puget: It's like being mad if the sun comes up in the morning. It just happens you know. Davey Havok: Yeah, you can't dedicate energy to being mad at that because it's just a fact of life. Scene Point Blank: How would you describe the band to fan relationship now as opposed to the past? Do you feel like fans do focus more on taking pictures than actually enjoying the show? Davey Havok: It's hard to say because we haven't played very much in the past few years. Scene Point Blank: Not even just for you guys, but if you're at a different show. Jade Puget: Oh yeah! People didn't have camera phones then. Every single person in the crowd has a camera, which is simply the case now, and you know fifty-percent of the people are going to be taking pictures. Jade Puget: Yeah, at least. Scene Point Blank: Now, you guys have a lot of fans devoted--I mean, you have people flying in from across the world who are coming to see these shows. Scene Point Blank: Was there ever a time when you were younger that you were That devoted to a band? Where you'd follow them around and maybe see all their shows on a tour? Anything like that? Jade Puget: I couldn't afford to do that. I couldn't afford to fly anywhere to see a band, but we were very devoted to music. 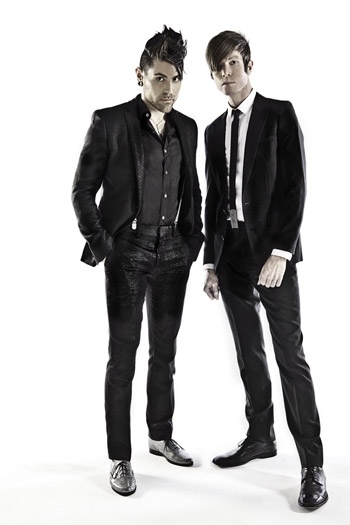 Jade Puget: I mean, even back as far as when The Faint--when Danse Macabre first came out--he and I had a day off on a tour--we flew to a different state to see them play. When was that, 2002? 1? Scene Point Blank: Yeah, if the 10-year anniversary [of Danse Macabre] is coming up, it had to be around 2002/2003. Davey Havok: Yeah. Oh yeah, 3. 2003. Davey Havok: Yeah. For sure. Scene Point Blank: I mean, that takes a lot. Not just money-wise, but that's just tiring. You're going on a 17-hour flight if you're going across the world. Scene Point Blank: When you guys start a Blaqk Audio cycle, does it kind of bother you when people bring up AFI more? You're trying to get into Blaqk Audio mode and you just have more people focusing on--"when's AFI coming back?" Davey Havok: It really only comes up in interviews, and I mean, it's expected. People are gonna ask about other things we do. Jade Puget: There's not really rules. Obviously we wanna focus on Blaqk Audio since we're out here, but some expect some people to know some unspoken rule like, "You're not supposed to talk about that 'cause we're doing this." It's not a big deal. Davey Havok: I mean when we do AFI interviews, people ask about Blaqk Audio too. It's just something that happens. I think people know what we do. Davey Havok: [Laughs] RIght, right. Scene Point Blank: [At Jade] You never thought about acting? Davey Havok: [Laughs] You did quite well. Scene Point Blank: [Laughs] You did, but we still don't know what you said. Jade Puget: Thank you, but...yeah, I don't even remember what I said. It was like--it's weird to act to me. I don't think I would ever do it. I'll stick to acting in videos. Scene Point Blank: Alright. [At Davey] Speaking of which, when's the Knife Fight movie supposed to be coming out? Davey Havok: Um, I believe January or February. February I believe. Davey Havok: Well, it just got major distribution. I believe it will be in Art Houses. I don't think it'll be in mainstream theaters, but it did just get distribution, so it will come out early next year. Yeah. Scene Point Blank: That's good news. We're waitin' on that one too. Davey Havok: Thanks! I look like Smith [Puget] in the film. In fact I'm wearing his clothes. Literally. I like borrowed a ton of his clothes. Scene Point Blank: You never write songs hoping he'll have the same mindset that you have, lyrically, going into it? Jade Puget: You know, I guess I don't really have a mindset, lyrically, going into anything. Davey Havok: I'm never really hoping for one thing. Scene Point Blank: You just kind of fit it into whatever you've got? Davey Havok: Yeah. Very typically, the music inspires me in one direction or another, lyrically speaking. Sometimes it will inspire me to go back to some note that I've had--that pre-exists--that I feel is appropriate to the tone of the music. It'll immediately trigger a memory of something I had written. Then I'll write based on that sentiment, or that concept, or that line. And other times, often, what Jade writes will inspire me immediately in a lyrical direction that is fresh based on the body of music. It usually goes one way or another. I never--I learned probably over 21 years ago that there's no future in writing entire groups--entire songs- worth of lyrics, because if you're not writing the top line and the music along with that, they never fit within a structure. It's a very difficult thing to do, so I don't have entire songs written out until the body of music is created to direct me. Scene Point Blank: You spent a lot of time looking for a new label. Now that you're on a smaller label, do you feel like there's less pressure to get music out than from a major label? Jade Puget:The pressure was always: Must. We're always pressuring ourselves and everyone else to get it out. Really, if the label is pressuring us to get music out, we'd be happy, because that's what we want. Jade Puget: We have so much music, we want it to get out there. Words by Aaron on Sept. 19, 2012, 6:56 a.m.
Posted by Aaron on Sept. 19, 2012, 6:56 a.m.
Posted Dec. 9, 2018, 12:21 p.m.
Posted April 7, 2018, 11:31 a.m.